In a Nov. 22 interview at the New York Times, President-elect Donald Trump said he had an “open mind” about climate change, but he went on to repeat some of the same false and misleading claims that have been used by those who reject mainstream climate science. 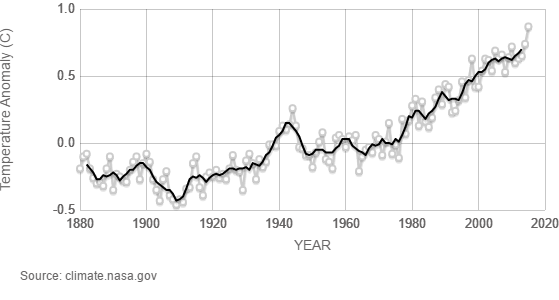 Trump said “the hottest day ever was in 1890-something, 98.” Cherry-picking one day, or one year, isn’t evidence of a trend. In fact, the long-term trend for average global temperatures shows an increase over the past several decades. He said that climate change is a “very complex subject,” adding, “I’m not sure anybody is ever going to really know.” Surveys have found that the level of consensus that human activity is primarily responsible for global warming is as high as 97 percent among climate scientists. Trump said there is “some connectivity” between climate change and human activity, but it “depends on how much.” The United Nations Intergovernmental Panel on Climate Change said it is “extremely likely” that human activity is the cause of over half of the observed temperature increase since 1950. The president-elect revived the now discredited claim that leaked emails — “horrible emails,” he called them — proved that climate scientists manipulated temperature data. But several independent investigations of the so-called “Climategate” found no such wrongdoing. Trump also said wind farms “don’t …. work at all without subsidy.” But, as we have written, wind energy globally and in the United States is now competitive with fossil fuel energy even without federal subsidies. The graphic depicts global surface temperatures relative to average temperatures for 1951-1980 — a departure from the average is known as the temperature anomaly. Gray circles show the annual average, while the black line represents five-year averages. The clear trend is a rise in global average temperatures. As we’ve explained before, picking the warmest year involves a margin of error, so there’s a chance that another year could be the warmest. But NASA said there was 94 percent certainty that 2015 was the new record, surpassing its previous estimate for the warmest year of 2014. We’ve seen other politicians cherry-pick the year 1998 to claim there hasn’t been hardly any warming since. But that year was unusually warm partly due to a very strong El Niño event. That year, the global average was .63 degrees Celsius above the 1951-1980 average, according to NASA, and 2015’s global average was .87 degrees Celsius above. Besides, climate scientists look at longer term trends, rather than variability compared with one year. As for the “hottest day ever,” in 2012, the United Nations’ World Meteorological Organization awarded that distinction to Death Valley, California, on July 10, 1913. It topped 134 degrees Fahrenheit, or 56.7 degrees Celsius, that day. The WMO determined that a previous record, of 136.4 degrees, recorded at El Azizia, Libya, on Sept. 13, 1922, wasn’t valid. On climate change consensus. Trump said that climate change is a “very complex subject,” adding, “I’m not sure anybody is ever going to really know” — casting doubt on the scientific consensus that climate change is real. But, as we’ve explained before, surveys of thousands of climate researchers have found that the level of consensus that human activity is primarily responsible for the warming climate is as high as 97 percent. A 2013 paper published in the journal Environmental Research Letters analyzed 4,014 papers that expressed a position on anthropogenic — human-caused — global warming. Of those papers, 97.1 percent endorsed the idea that humans are causing global warming. In addition to that finding, a second analysis in that same 2013 study asked 8,547 authors if they think their papers endorsed the consensus on warming. A total of 1,189 scientists responded, rating 2,142 individual papers. The results: 97.2 percent of the papers endorsed the consensus that humans are causing global warming. Those results were consistent with the findings of earlier surveys published in the American Geophysical Union’s Eos magazine in 2009 and in Proceedings of the National Academy of Sciences in 2010. On human contribution to climate change. Trump later said that there is “some connectivity” between climate change and human activity, but it “depends on how much.” As we have written, the United Nations climate change research organization says that it is “extremely likely” that human activity is the cause of over half of the observed temperature increase since 1950. “Extremely likely,” according to the IPCC report, means that the likelihood of an outcome is between 95 percent and 100 percent certain. The IPCC added that “the best estimate of the human-induced contribution to warming is similar to the observed warming over this period.” That is, its best guess is that humans have caused essentially all of the warming that has occurred in that time. On “Climategate” emails. Trump referenced the “horrible emails” from the Climatic Research Unit at the University of East Anglia that were stolen and made public during the so-called “Climategate” controversy, beginning in 2009. As we have written several times, those emails were investigated and no wrongdoing was found. Climate skeptics claimed that the leaked emails between many climate scientists around the world showed there was a coordinated effort to inflate the global warming signal in temperature data. But several independent investigations, including by the U.S. Department of Commerce Inspector General and the Environmental Protection Agency, found no such wrongdoing or manipulation. An international panel set up by the University of East Anglia concluded: “We saw no evidence of any deliberate scientific malpractice in any of the work of the Climatic Research Unit and had it been there we believe that it is likely that we would have detected it. 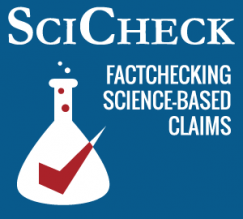 Rather we found a small group of dedicated if slightly disorganised researchers who were ill-prepared for being the focus of public attention.” In 2011, the National Science Foundation inspector general also found no evidence of research misconduct. Although critics of mainstream climate science have continued their attacks on researchers, the science has become even more solid. The IPCC’s fourth assessment report in 2007 said it was “very likely” (greater than 90 percent probability) that greenhouse gases had caused most of the warming. That assessment was upgraded to “extremely likely” in the report released in 2013. Trump also said “the wind is a very deceiving thing,” and went on to list some misperceptions about the cost of wind energy and its impact on birds. Trump: I mean, for the most part [wind farms] don’t work. I don’t think they work at all without subsidy, and that bothers me, and they kill all the birds. You go to a windmill, you know in California they have the, what is it? The golden eagle? And they’re like, if you shoot a golden eagle, they go to jail for five years and yet they kill them by, they actually have to get permits that they’re only allowed to kill 30 or something in one year. The windmills are devastating to the bird population, O.K. With that being said, there’s a place for them. But they do need subsidy. So, if I talk negatively. I’ve been saying the same thing for years about you know, the wind industry. I wouldn’t want to subsidize it. It is true that wind energy receives federal tax credits for production and investment and, as a result, the industry has grown substantially in recent years. In 2015, wind supplied more than 10 percent of electricity generation in 11 states, including nearly a third of the electricity in Iowa, according to the U.S. Energy Information Administration. Wind now provides about 5.6 percent of the electricity in the U.S., more than double its share in 2010, EIA said. The increase of wind power in the U.S. is the result of a combination of technological changes, such as improved wind technology and increased access to transmission capacity, and policy changes, such as federal tax credits and state standards that require utilities to sell a certain amount of renewable electricity, EIA said. But, as we have written, wind energy is competitive with fossil fuel energy even without federal subsidies. Bloomberg New Energy Finance earlier this month provided us with the levelized cost of electricity (LCOE) without government subsidies for natural gas, coal and wind for the second half of this year. The LCOE represents the per megawatt hour (MWh) cost of building and operating a generating plant over the life-cycle of the project. Natural gas is less expensive ($52 per megawatt hour) on average in the U.S. than onshore wind ($56 per MWh), but coal is more expensive than both at $65 per MWh. A year ago, Bloomberg New Energy Finance found that electricity from wind was cheaper than coal and natural gas in both the United Kingdom and Germany. The levelized cost of wind globally has dropped 50 percent from 2009 to 2014, according to Bloomberg. As for the impact of wind farms on birds, we wrote that reliable data are scarce, but current mean estimates range from 20,000 to 573,000 bird deaths per year. Research also suggests oil production kills the same, if not more, birds per year than wind farms. And Trump is wrong about the penalty for shooting an eagle. The maximum civil penalty is one-year imprisonment or two for repeat offenders, not five years, and we found first-time violators are likely to serve little or no time in jail. Previous StoryVideo: ‘Criminal Aliens’ in the U.S.